The publication of Manual for Streets in 2007 revolutionised how we think about our highways. A new age of street design introduced concepts like shared space, homezones, and decluttering that radically challenged the norms of traffic efficiency, safety, and risk commonly associated with highways. Kent has led boldly on this, transforming the ring road in Ashford into a shared space and high quality public realm with public art, bespoke street furniture and planting. Research emerged to support the case for street design offering healthier lifestyles, increased property prices and better traffic management. 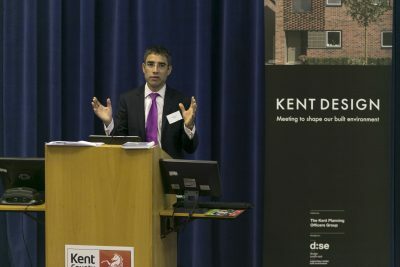 Today, at a time when Kent is witnessing unprecedented growth, often through substantial urban extensions, ‘Designing Our Highways’ debates solutions to the tensions that still exist between building roads and making places. How do we balance the needs of between traffic and pedestrians; between housing, public transport and car parking; and between beauty and efficiency?